Jurassic World 2 “Fallen Kingdom” first full movie trailer will be out on Thursday, December 7, 2017. Below is the behind the scenes video. Full length trailer will be added here once released. Movie Plot: A volcanic eruption threatens the remaining dinosaurs on the island of Isla Nublar, where the creatures have freely roamed for several years after the demise of an animal theme park known as Jurassic World. Claire Dearing, the former park manager, has now founded the Dinosaur Protection Group, an organization dedicated to protecting the dinosaurs. 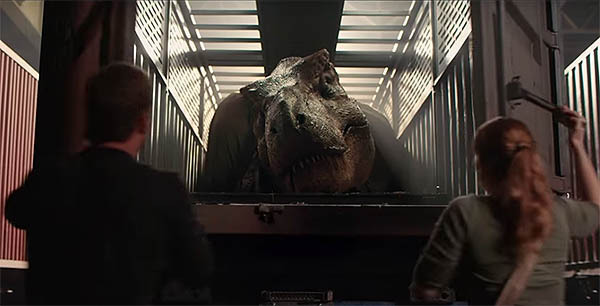 To help with her cause, Claire has recruited Owen Grady, a former dinosaur trainer who worked at the park, to prevent the extinction of the dinosaurs. Starring Bryce Dallas Howard, Chris Pratt and Jeff Goldblum, directed by JA Bayona, Jurassic World 2 “Fallen Kingdom” is set due on June 22, 2018.